Following Hurricane Katrina in 2005, like everyone on the Gulf Coast, our lives were in turmoil. In addition to the logistics of basic needs such as shelter, phone service and, most important, tracking down friends and loved ones, there was a business and a staff, several of whom lost everything they owned, to consider. Although the gallery was undamaged, it would be months before it regained basic business necessities such as electricity, plumbing, phone service, mail and fedex delivery, an available staff and, needless to say, customers. As I described in our post-Katrina story in an earlier essay, we were the lucky ones. Our home was damaged but far from destroyed, and our business, we knew, would open again. However, there were hiccups. Our warehouse was basically a total loss. And although we saved most of the artwork, we lost millions of dollars in silkscreen prints, in some cases entire editions wiped out. Furthermore the structure was no longer viable as a place to house art. Before George could address returning to his easel (which meant painting in his son’s TV room in Lafayette), we needed a new home for our inventory and archives. And we needed it fast, because Hurricane Rita was on its way. Within two weeks we moved a career’s worth of artwork from a crumbling warehouse in New Orleans to a new space in Lafayette, Louisiana. We found a temporary gallery location (also in Lafayette), arranged housing for our staff, and put everyone back to work. And by the end of September, George Rodrigue was committed to a relief print. We Will Rise Again originated, oddly enough, from an earlier tragedy, September 11, 2001. On that horrible day George painted God Bless America, surprising everyone, including himself, when the one thousand prints raised $500,000 for the American Red Cross in just a few weeks. (For the image and story, visit here). We discussed how much more money we could have raised had we not limited the edition! Like so many people after Katrina, we were devastated for our city, for the loss of lives, neighborhoods, and communities, for the suffering of thousands, and we felt desperate to help. Following the lesson of God Bless America, George produced an open edition of We Will Rise Again, limiting the offer instead by time rather than number, so that people felt an urgency not only to help, but also to help now. 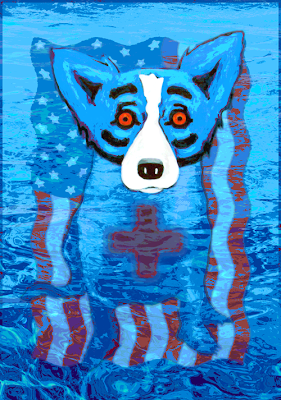 Within a few months this one print raised nearly $700,000 for area relief, mostly for a special designated fund for the southeast Louisiana Chapter of the American Red Cross but also later, combined with six more prints (initially called ‘Blue Dog Relief’ and now the George Rodrigue Foundation of the Arts), for numerous humanitarian, education, and arts organizations, totaling more than $1.5 million for Gulf Coast causes, and more than $2.5 million in all (details in my next post). In addition, creating a print for Katrina relief was far different for George than creating a print for 9/11, because he was personally affected. He faced this tragedy in his own backyard, suffering along with the rest of his beloved state and the Gulf Coast, and he struggled to express these emotions on his canvas. Once he formed the concept (detailed below), he faced the challenge of effectively producing a silkscreen without access to his studio, supplies or printer. In addition, his initial attempts at painting the water resulted in a marble-type effect, something he rejected even as he tried painting it numerous times. In the end he photographed the water in a friend’s swimming pool, printed the image on a large canvas, and then painted the flag and dog on top. “Those of us from south Louisiana grew up with the aftermaths of hurricanes Audrey, Betsy, Camille … and now Katrina. As in times before, “We will rise again.” Tears and rising water threaten to drown us. But don’t be deceived. The land may be under water, but the spirit of New Orleans and the culture of Louisiana hold their heads high. We Will Rise Again shows the American flag covered with water. The blue dog is partly submerged, and its eyes, normally yellow, are red with a broken heart. Like a ship’s SOS, the red cross on the dog’s chest calls out for help. Katrina hit me personally at ground zero. My immediate thought was for the safety of people I know, followed by the shock of seeing helicopters and boats alongside familiar street signs, as rescuers assisted people from rooftops and attics. For the second time in this young twenty-first century I sat at my easel weighted by personal sorrow and my desire to help, this time also reflecting on the devastation of my city and the suffering of my neighbors. New Orleans has been home to my gallery and studio for sixteen years; it is where the Blue Dog was born. My wife is a third generation New Orleanian, and the Big Easy remains the “big city” to my Cajun hometown of New Iberia. Wendy and I join thousands of New Orleans residents in our pledge to go HOME, to rebuild our city, and to pay tribute to those who lost their lives with a commitment to care for our citizens, embrace our culture, and make the good times roll … again” – G.R. That said, few would describe our city as perfect, and there are certainly those still struggling with rebuilding, with insurance claims, and even trying to return home. These days, in my opinion, the best way to help New Orleans is by visiting the city and having a great time. You'll feed our economy, ensure our jobs, and stroke the pride of one of the most unique, diverse, and downright gratifying cultures in America. *Or the opposite: One day in the spring of 2006 not long after we re-opened, I happened to answer the phone when a woman called the gallery and asked if we were still under water … as though I were tending to business while floating on a raft (I remember thinking). To contribute to current GRFA programs (formerly 'Blue Dog Relief'), benefiting arts education throughout Louisiana, see the headline "Do You Enjoy Musings?" to the right of this post. That only proves that people with the heart in the right place brings hope to everyone in a world that makes people doubt the good forces. we bought this Blue Dog when it first became available - it has hung in our home ever since. we are both LSU grads and Louisiana is the "home of my heart" - thank you for all you have done to raise money and awareness for NOLA and the state. Using unfortunate situations to promote your art is just unsavory. I know some artists are good businessmen/women... but .. there should be an ethical border.